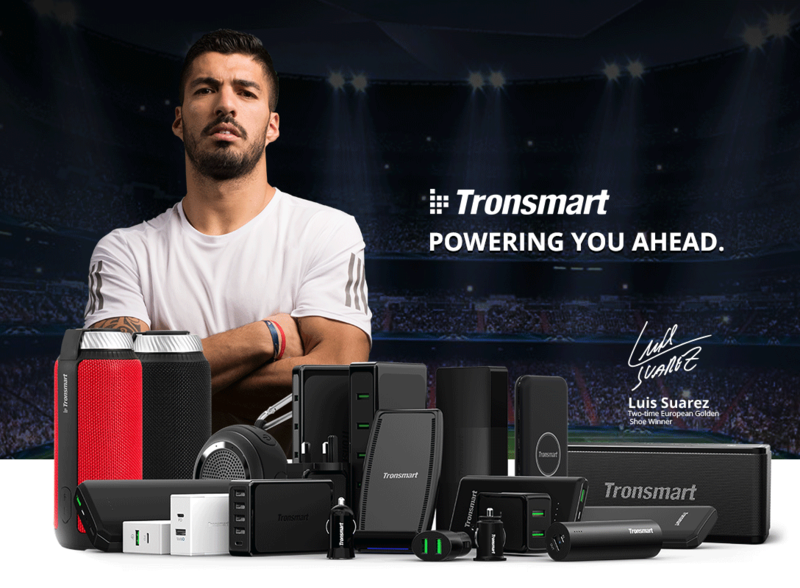 Tronsmart has signed one of the world’s most recognized football stars Luis Suárez as their official brand ambassador. Suárez will act as an official spokesperson representing the brand Tronsmart. Tronsmart is a tech brand that has grown rapidly in America, Europe, Middle East & many Asian countries. Their portable chargers, cables & audio products have been well received throughout the world. Tronsmart claims to be one of the world’s most innovative consumer electronic providers offering their customers high-quality products with a premium finish. Suárez has been deemed “the perfect fit” for this company due to shared values and motivations. Tronsmart has a diverse line of products equipped with top-notch features that enrich the lives of their customers. The 2018 FIFA World Cup is a great challenge ahead for Luis Suarez and his team. Tronsmart has been able to overcome many challenges and deliver impeccable products for all consumers. Suárez is very excited to be a part of this journey with Tronsmart & together they hope to power their fans & customers ahead. This new collaboration is also a great opportunity for Tronsmart to display their new products. The Element Mega is fresh on the market & selling fast. This 40W Bluetooth Speaker is portable & extremely loud. 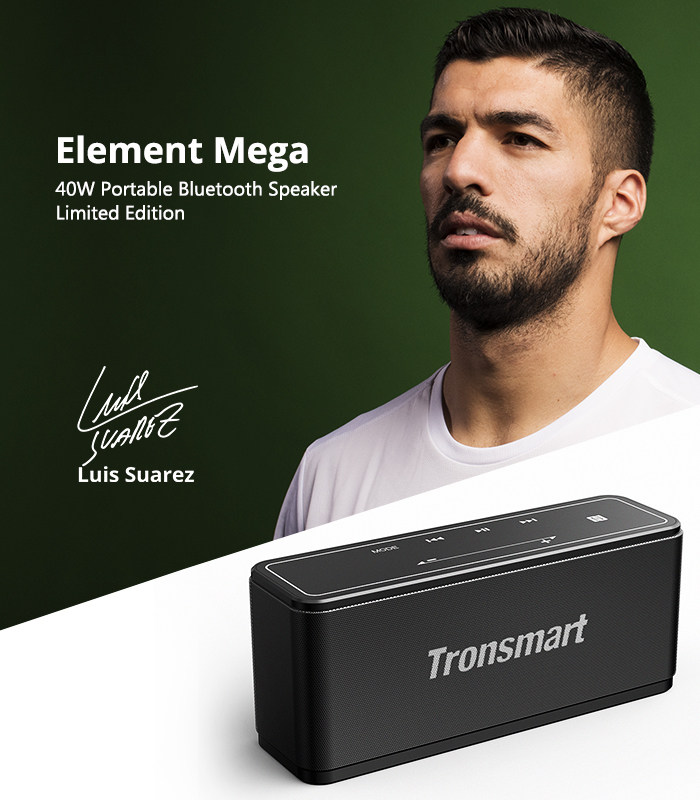 The Element Mega is the Champion of Bluetooth Speakers & will sound great while watching Suárez take the World Cup this year. Now Tronsmart's official distributor, Geekbuying, is holding a worldwide giveaway with a football signed by Luis Suárez and packages of gifts, grab yours on the activity page here. Learn more about Tronsmart new products, check on their Facebook page. Suárez has always associated with companies that have a vision of making the world a better place. These same standards are shared by Tronsmart as they strive to make people’s lives easier with their products. Suárez’s is a fierce competitor and works hard to achieve great success. Tronsmart has also put years of hard work into their products to ensure the best quality possible for their customers. In terms of showcasing Tronsmart’s high-performance product line, Suárez is the perfect man for the job. 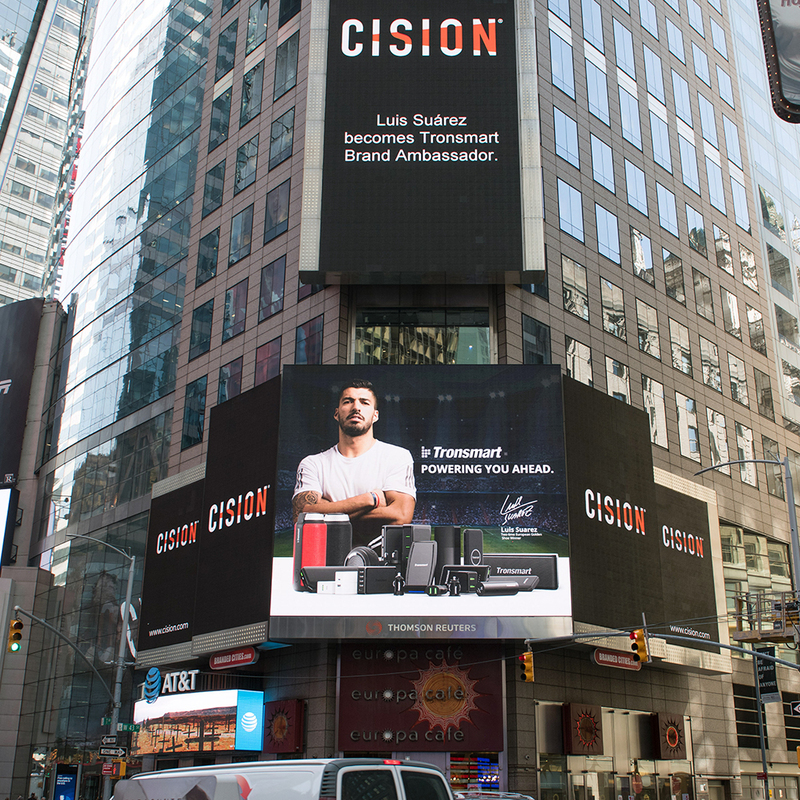 Tronsmart products and our brand ambassador, Luis Suarez were represented at Times Square in New York.